More than ever before, all of the banking industry’s constituencies are being impacted by the transformation of the banking industry. The category that has the most to gain from the changes expected in 2016 will be the consumer. They are not only in the driver’s seat with regards to being able to voice their digital banking expectations, but there are more firms than ever trying to meet those expectations. As banking organization further digitize their offerings, the consumer will benefit. In 2016, we will see end-to-end digital account opening and onboarding solutions, contextual offers, better pricing that reflects the economies from digital transformation and a greater array of offerings coming from the partnership of fintech and legacy banking organizations. We expect to see this wave of enhanced consumerism continue for the next several years. As margins get squeezed, competition intensifies and the government opens the door for a free market banking system, the banking industry will be in a constant state of flux. For the fifth consecutive year, we have surveyed a panel of close to 100 global financial services leaders for their thoughts around upcoming retail banking and credit union trends and predictions. The crowdsourced panel includes bankers, credit union executives, industry analysts, advisors, authors and fintech followers from Asia, Africa, North America, South America, Europe, and Australia. 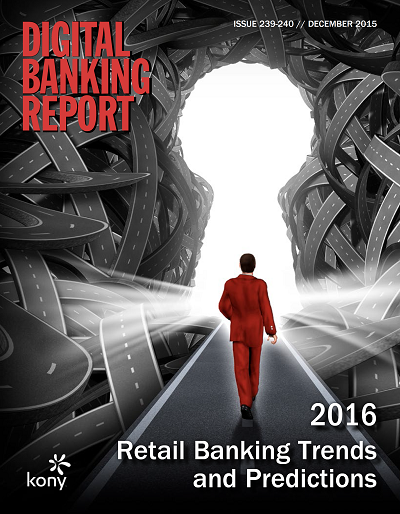 The 82-page Digital Banking Report, ‘2016 Retail Banking Trends and Predictions,’ Provides the most comprehensive analysis of upcoming trends in the financial services industry. Interviews were combined with in-depth analysis, charts and case studies around each trend to make up this year’s report. We would like to thank Kony, Inc., who sponsored this year’s report development and distribution. Their partnership enabled us to reach more industry gurus and compile more statistics than ever before. More than ever before, all of the banking industry's constituencies are being impacted by the transformation of the banking industry.